In “Let’s Pretend This Never Happened”, Jenny Lawson baffled readers with stories about growing up the daughter of a taxidermist. 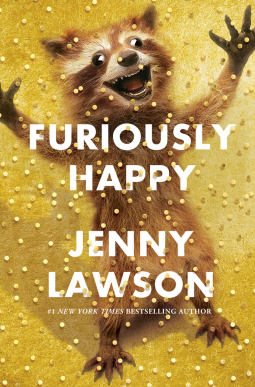 In her new book “Furiously Happy”, Jenny explores her lifelong battle with mental illness. A hysterical, ridiculous book about crippling depression and anxiety? That sounds like a terrible idea. And terrible ideas are what Jenny does best. Jenny's first book “Let’s Pretend This Never Happened”, was ostensibly about family, but deep down it was about celebrating your own weirdness. “Furiously Happy” is a book about mental illness, but under the surface it's about embracing joy in fantastic and outrageous ways-and who doesn't need a bit more of that? I adored Jenny’s first book. I frequently had to go out to my car to read it on my lunch break because I was laughing so hard I was ‘disturbing my co-workers’. I have never laughed so hard whilst reading before, and it was truly a glorious experience and an amazing read. So it was a no brainer that I would, of course, be picking up any further books Jenny wrote, and as soon as I saw the cover and title I knew I would be in for a treat. Don’t be fooled though, because yes, there is plenty of laughter and merriment and general insanity (raccoon rodeo anyone?) but there are also much more serious sections which in turns punched me straight in the feels, made me nod along and go YES, SOMEONE ELSE UNDERSTANDS and sob, and also pass the book over to Husband with the instructions to read this because Jenny explains it so much better than I ever could. It is outrageous and funny and heartfelt and full of poignant moments and good advice. In short, Jenny has done the impossible and created a truly brilliant blend of humour and seriousness tackling life with mental illness. It’s still so much of a taboo to discuss mental illness and Jenny throws all of that out the window and does a truly spectacular job of talking about it in ways that will both appeal to sufferers and those hoping to understand more. I’m bulk ordering many copies of this book to go to various people for Christmas because it is brilliant. If you want an amazingly wacky and hilarious book – read this. If you want a book that talks honestly and openly about mental illness – read this. If you fancy some non-fiction – read this. If you’re not sure you like non-fiction books – read this. It is for everyone (apart from minors, because some of the language used isn’t appropriate but is utterly brilliant. Save a copy for them for when they’re older.) and everyone should be reading it. Plus look at that cover. That cover alone should be giving you a good idea of what’s waiting for you inside – insanity and hilarity written by a truly incredible writer. This sounds so unbelievably good! I clearly need to get my hands on a copy. Do it! You won't regret it for a moment, it is pure unadulterated genius!